Bellatrix, I'm a Pug! 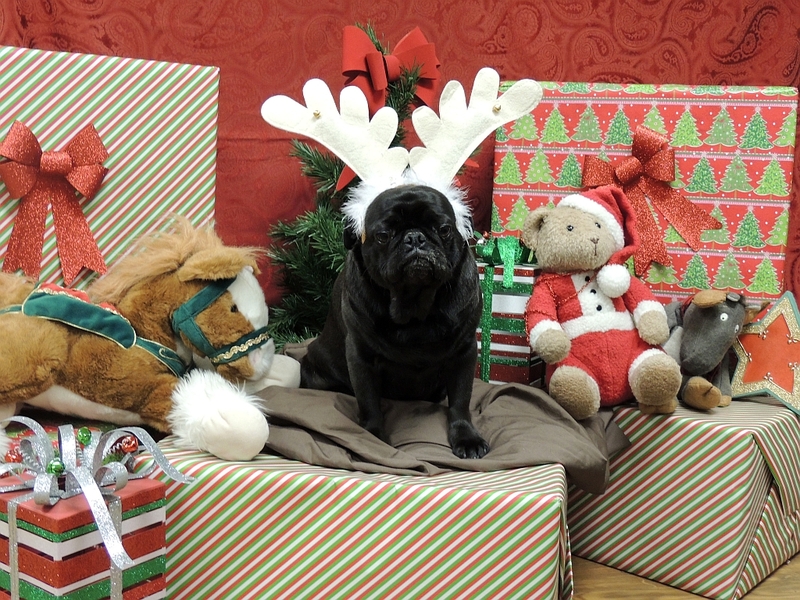 : Merry (puggie) Christmas!!! Even though I don't look too happy, I secretly enjoyed having funny antlers on my head. Maybe I'll go and pull a sled, or run through the forest. Maybe I'm a new species of undiscovered critter....A "Pugalope?" 2013 is going to be pretty exciting for The Belly. I'm paw-deep in a few projects, and will keep everyone updated on here, and on my Facebook page. It's gonna be BIG! MERRY CHRISTMAS BELLA-T!!! Love your antlers! Scarlet has a pair too! Merry Christmas, Bella! You look great with antlers. Hope you got something good for it. Merry Christmas Bellatrix..Love the antlers..
Hee Hee A Pugalope!! You do look great!. Hope you had a great Christmas and we look forward to whats in store for the new year! Belly, I think you look beautiful! I'm glad your not as unhappy as you look! You look so cute! Hope your Christmas was extra good and that you got lots of good treats! Awesome pic, Bells! Hope you had a terrific Christmas and look forward to hearing about all of your 2013 projects. Glad you had a super Christmas Bella and hope your 2013 is everything you want it to be! You are rocking those antlers like nobody's business! Wishing you and your family a happy new year!